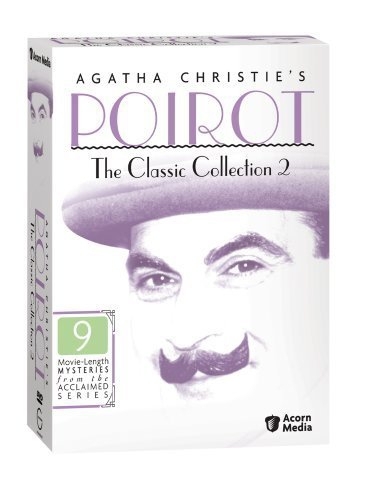 This whodunit series based on Agatha Christie's crime novels and short stories, is named after its star sleuth, Hercule Poirot, a famous former Belgian policeman, who settled for good in London after the war, soon so famous as an infallible private detective that he becomes a society figure in his own right. 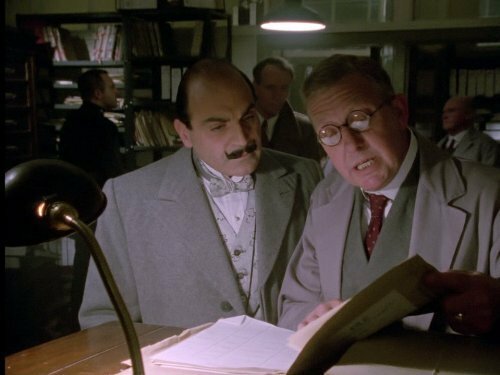 In each episode Poirot gets to solve a crime mystery -mostly murder(s)- for a paying client or otherwise catching his attention, generally along with his faithful English sidekick Captain Hastings and/or his Scotland yard 'friendly rival' Detective Chief Inspector Japp. 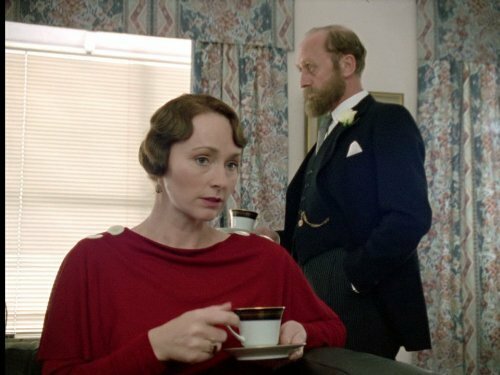 Poirot is approached by a Mrs. Todd, whose cook, Eliza Dunn, has suddenly disappeared. 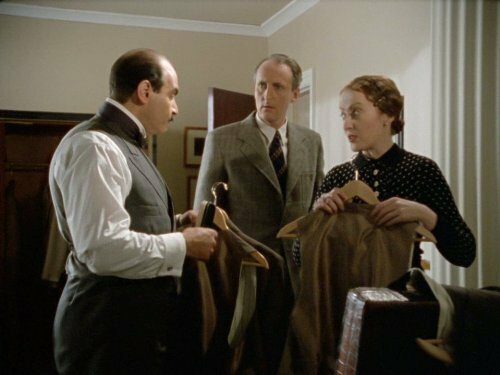 Poirot manages to track down the cook , and she tells him that a stranger, acting for a law firm, told her that she had inherited a property in the North of England but she had to go there immediately. Her heavy trunk was called for but it was deposited at the train station, where Poirot makes an interesting discovery, connected to a recent bank robbery. Poirot is enlisted by Japp to help solve a mystery that took place on Bonfire Night in a mews flat. A Mrs. Allen was found shot, apparently a suicide, but she was holding the gun that killed her in the wrong hand, and foul play is suspected. Furthermore, the ash-tray in the room contained the stubs of Turkish cigarettes smoked by one Major Eustace, a disreputable acquaintance.The victim was engaged to be married and seemingly had no cause to take her own life. Did she? Or was it murder in the mews? 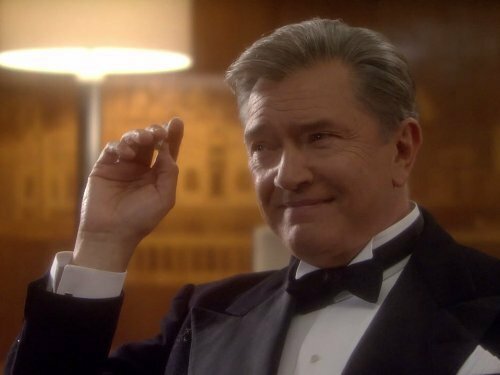 Mr. Waverly, a man whose wealth belongs to his rich wife, comes to engage Poirot's services. He has had a letter telling him that his little son Johnnie will be kidnapped for ransom. 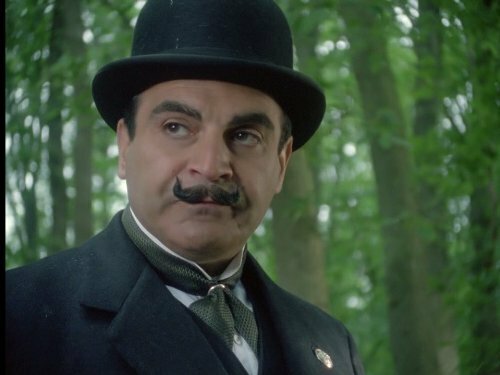 Although Poirot is present at the Waverly home, the kidnapping goes ahead but all is not as it first seems. The estranged, elderly Gascoigne brothers are found dead within days of each other. The one, Anthony, died in his home in Brighton in circumstances that give no cause for suspicion. The other brother, Henry, an eccentric, reclusive painter, however, has fallen downstairs and been dead for some time before his death is discovered. 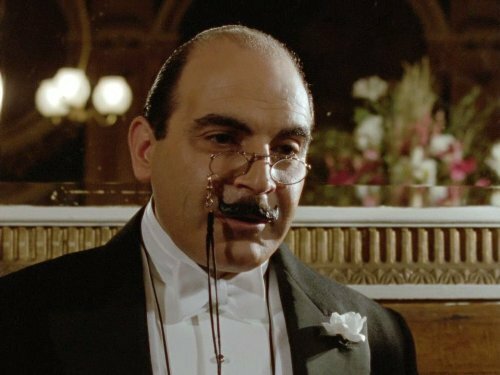 Poirot had been eating in the same restaurant as Henry just before the death. Henry had been pointed out as a creature of habit, a man who always ate exactly the same meal on every visit. 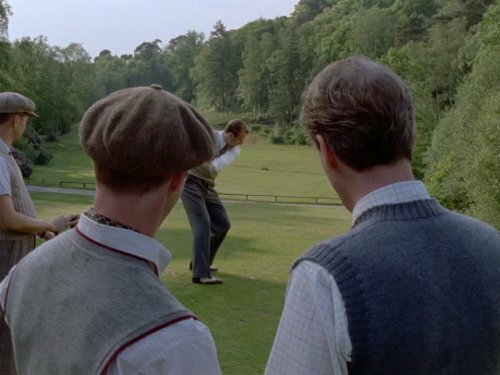 On this last occasion, though, he had had a completely different set of courses, which leads Poirot to suspect foul play. Hercule Poirot is bored to tears and with three weeks since his last case, is worried that his little gray cells will stop working. Captain Hastings suggest a evening at the theater to see the latest murder mystery but even that doesn't help when Poirot finds the plot to be absurd. On their return home to Whitehaven Mansions, they learn that the new occupant of the flat two floors below Poirot's has been found shot. She had only moved in that very same day and was an unknown. 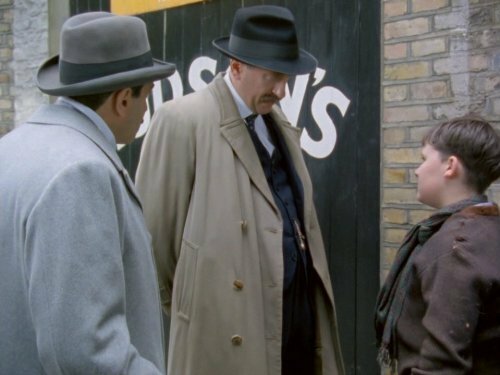 Poirot puts his little gray cells to good use and assists Inspector Japp of Scotland Yard in identifying the murderer. Just as his holiday on the island of Rhodes is coming to an end, Hercule Poirot finds himself investigating a murder when one of the hotel guests, Valentine Chantry, is poisoned in the bar. The drink she had was apparently meant for her husband and had been bought by Douglas Gold, with whom she had been carrying on since her arrival. 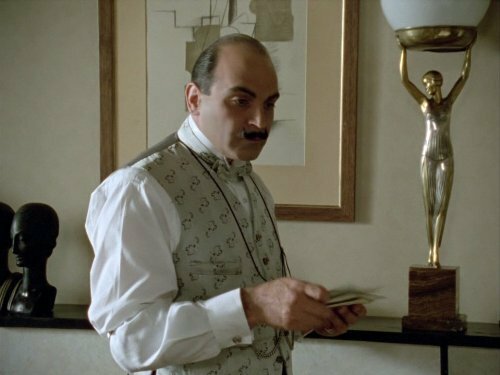 Gold is arrested and everyone assumes he is the perpetrator but Poirot thinks otherwise however and looks to the other guests in the hotel as more likely suspects. When a local pathologist confirms that the poison used was local in origin, Poirot realizes that only when he learns who purchased the poison will he learn the killer's identity. 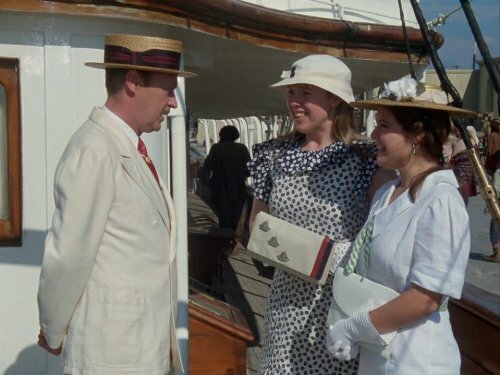 While on a Mediterranean cruise, Poirot is asked to investigate the murder of one of the passengers, Mrs. Clapperton who is found stabbed in the chest in her stateroom. She was somewhat haughty and generally disliked by the other passengers. Her henpecked husband, Colonel Clapperton, was ashore for the entire day with two other passengers. General Forbes, who admits to having been in love with the dead woman when they knew each other many years before, says he was having a nap. Then there is Miss Ellie Henderson, who is attracted to Colonel Clapperton but whose wife is in the way of any possible relationship. With everyone having a reasonable alibi, it is left to Poirot to find the killer. Tommy Mayfield is a British industrialist who has developed a new fighter plane. Up to now he has paid all development costs himself and he very much wants the government to contribute. It is reluctant to do so because of an apparent indiscretion some years before when Mayfield was supposed to have sold heavy artillery to the Japanese. In order to get back into the government's good books, he decides to lay a trap for Mrs. Vanderlyn, a known Nazi sympathizer and possible spy. 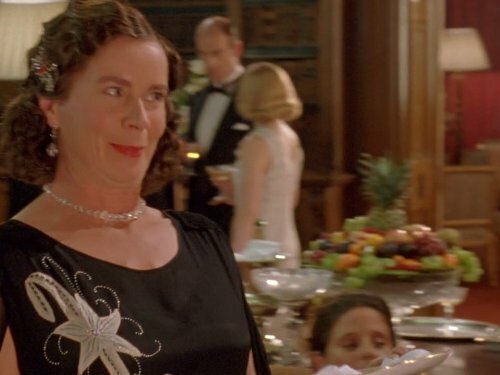 The bait is the plans for the new fighter but Mayfield's wife is so concerned that she asks Hercule Poirot to spend the weekend at their house to make sure Vanderlyn doesn't get away with anything. 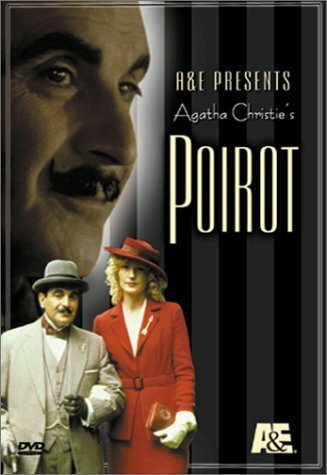 After a visit to Parade film studios with his friend Captain Hastings, Poirot finds himself investigating the murder of Henry Reedburn, the head of the studio. Reedburn was something of a tyrant who had fired a veteran actor, taken over a major film from a young director and had recently blackmailed actress Valerie Saintclair into signing a new contract. Upon finding the body, Saintclair ran to a neighboring house to seek help, interrupting the Oglander family's bridge game in the process. However, the lack of a king of clubs on the card table provides Poirot with only clue he needs to solve the crime. 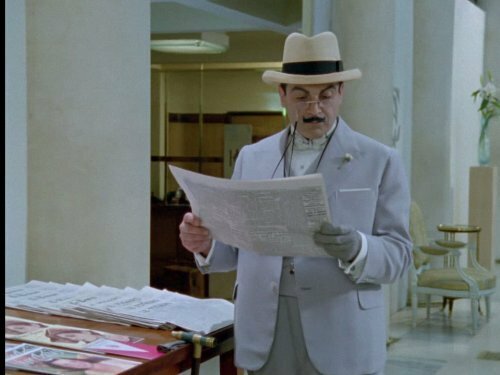 Hercule Poirot is hired by Lord Pearson, who happens to the head of the bank where Poirot keeps his accounts, to find Mr. Wu Ling who was to have attended a meeting at the bank hat morning, but has disappeared. The missing man was to sell the bank a deed to a silver mine. When the man is found dead, finds himself searching for a killer. All of the evidence seems to point to an American, Charles Lester, but Poirot finds that to be just a little too convenient. At home, Poirot and Captain Hastings find themselves involved in a vicious game of Monopoly! 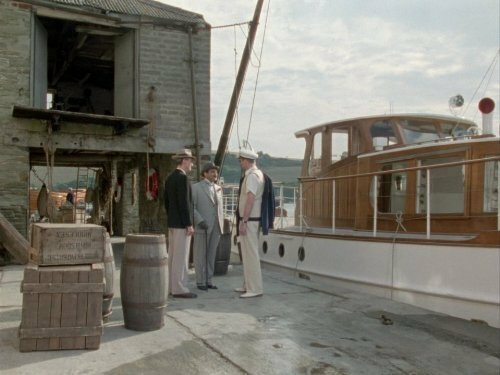 Poirot and Captain Hastings travel to Cornwall at the request of Mrs. Pengelly but arrive to find that the woman is dead. She had told Poirot the previous day that she feared her dentist husband, Edward Pengelly, had been having an affair with his pretty receptionist and that further, he was trying to poison her. Apart from her husband, she has a niece and her fianc?, but no other relatives in the village. When Inspector Japp arrest the husband for murder, the Belgian detective is convinced that the wrong person is in the dock. Banker Mr. Davenheim steps out of his house, into the fog, and disappears. Where has he gone? 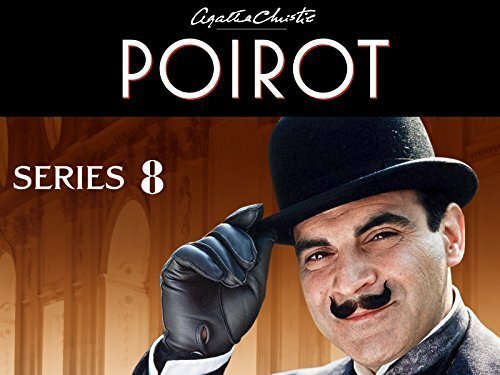 Poirot bets good friend inspector Japp five pounds that he can solve the mystery within the week, without leaving his flat, using Captain Hastings to collect the clues. A bored Hercule Poirot announces that he is going to retire and suggests that he and Captain Hastings go to the seaside for a short holiday. While there, they meet a pleasant young woman who is delivering a set of miniature portraits to an American buyer on behalf of her aunt, an antiques dealer. When they arrive at their destination she is shocked to find that the miniatures are missing and that the American had already bought them from an elderly lady more than an hour before. As Poirot has retired he leaves the case in the hands of Hastings who slowly puts the facts together and not surprisingly comes to the wrong conclusion. 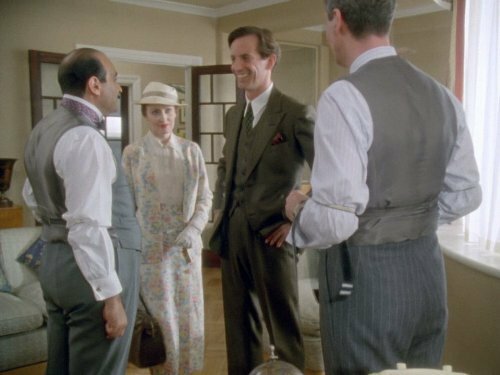 In the end, it is left to Poirot to suggest the solution to the crime and brings all of the parties together for an interesting lunch. 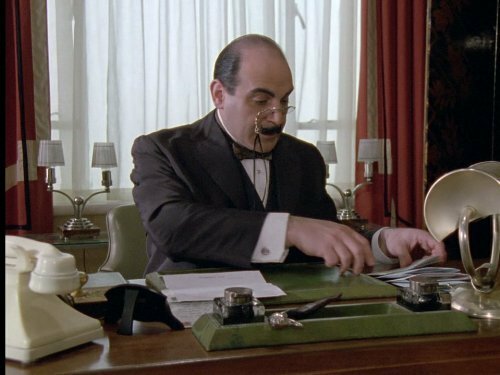 Poirot finds himself working on two cases, the first of which is more of an amusement, or so it seems. After meeting a delightful young couple, Stella and James Robinson, at a party he sets out to prove to Captain Hastings that there must be a reason for their good fortune in getting a lovely flat at a ridiculously low price. 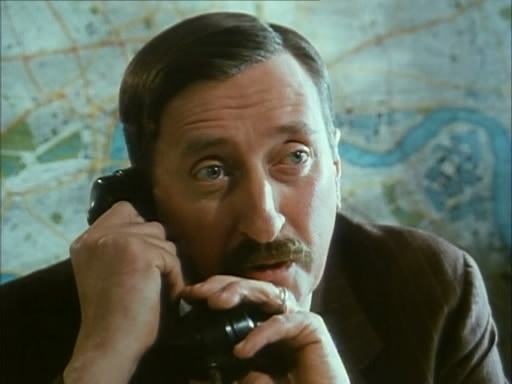 He is also brought into a more formal investigation by Inspector Japp who is hosting a loud-mouthed American FBI Agent who is on the trail of thieves who have made away with secret US Naval plans for a new submarine. The American isn't too impressed that Scotland Yard have brought in a private detective or that Japp has taken away his gun. When Poirot sees the man the FBI is trailing, he also realizes it's the same man who he has seen lurking outside the Robinsons apartment block. En route to the train station to attend a disarmament conference in Paris, the Prime Minister's car is attacked by what the press describe as ruffians. The PM is slightly injured and does make it across the Channel to French soil, but never arrives in Paris. 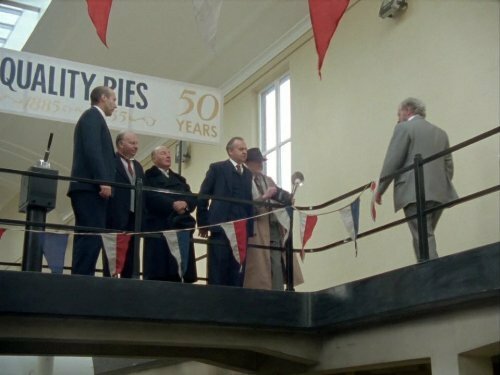 Poirot is called in by senior government officials as it appears the Prime Minister has been kidnapped. He soon comes to the conclusion however that the evidence from the first attack doesn't quite add up and all is not what it seems. 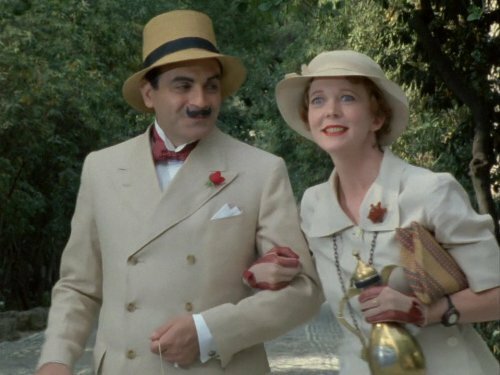 Poirot is thrilled to receive an invitation from renowned Belgian actress Marie Marvelle. She has been receiving anonymous notes about the Western Star, a valuable diamond purchased by her husband a cut-rate price several years before. The notes speak to the mystical nature of the diamonds and that they should be returned to their rightful owners. The next day, Lady Yardly claims to also have received similar notes about her own fabulous diamond, the Eastern Star. 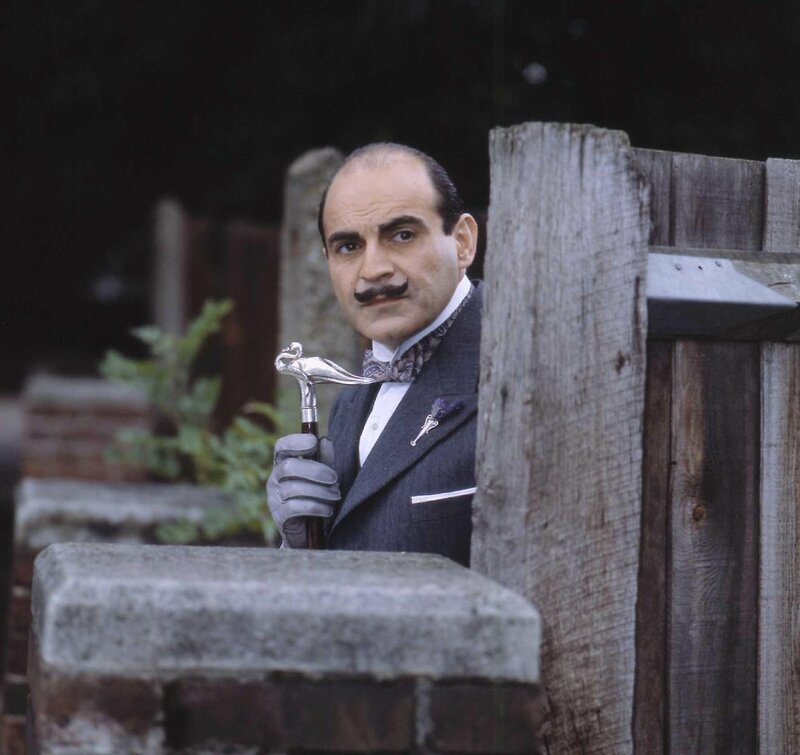 When Poirot and Hastings visit Lord and Lady Yardly the diamond is stolen in a daring robbery. Needless to say, none of this sits well with Poirot who finds he has a very tight knot to untie. Recovering from the horrors of World War I, British Army officer Arthur Hastings hopes to find peace and quiet at a country manor in the English countryside. But when the matriarch dies during the night from strychnine poisoning, Hastings enlists the help of an old friend staying nearby with other war refugees to help solve the murder: former Belgian police detective Hercule Poirot. 2How Does Your Garden Grow? 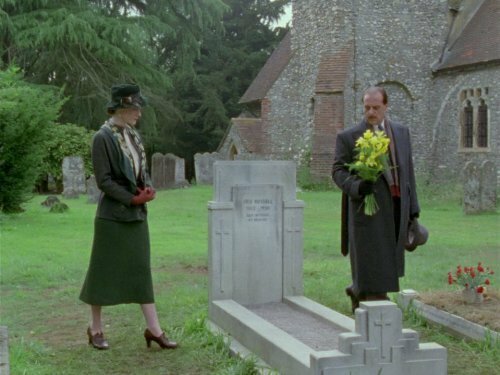 Poirot and Miss Lemon travel to Surrey to visit Miss Amelia Barrowby but arrive to learn that she has died during the night. Poirot had an odd encounter with her the previous day at a flower show when she made the odd gesture of giving him an empty seed packet. Upon returning home, he finds that she has written him seeking his assistance. Poirot suspects foul play and the pathologist confirms that the woman was poisoned with strychnine. Initial suspects are Miss Barrowby's niece and her husband, but when the dead woman's Russian companion runs away, Inspector Japp thinks he has the culprit. Poirot thinks otherwise. London & Scottish bank officer Mr. Shaw is scheduled to ride the maiden voyage of the Queen Mary to transfer $1 million in Liberty Bonds to the banks branch in America. But when Mr. Shaw is first almost run down in the street, and then poisoned, the assistant bank manager must take the bonds instead. 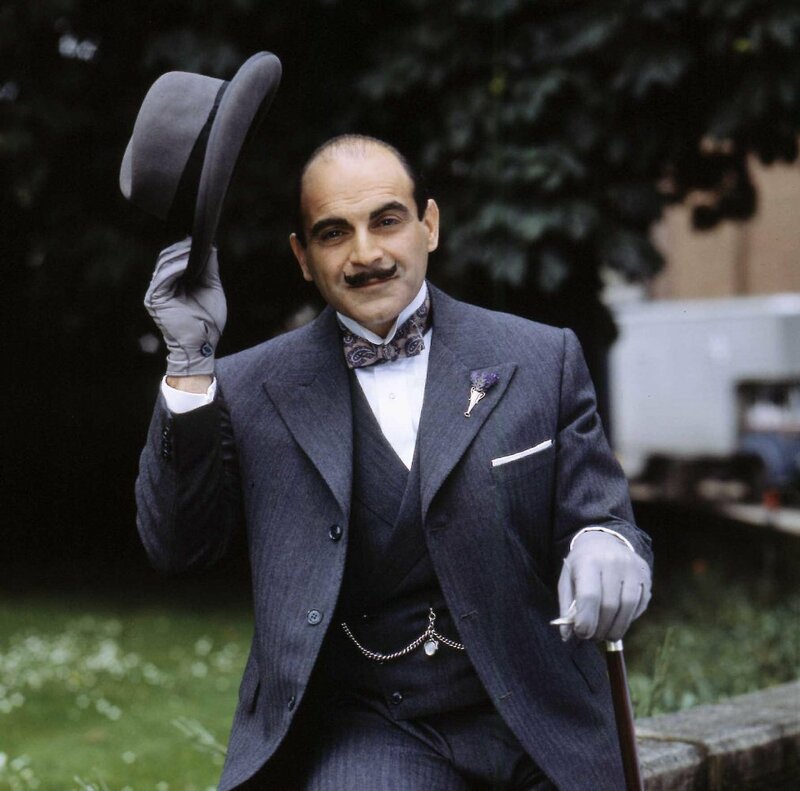 The bank hires Poirot to accompany the bonds, so he and Mr. Hastings are able to ride the maiden voyage of the Queen Mary, much to Hastings delight. But when the bonds are stolen, suspicion falls on the assistant manager who has a history of large gambling debts. Poirot investigates the murder of Florence Carrington while traveling on the express train to Plymouth. Her father, mining entrepreneur Gordon Halliday, will spare no expense to have the crime solved. She had recently been approached by her estranged husband Rupert, asking for money and was seen having lunch with a one-time suitor, Armand de la Rochefort, of whom her father disapproves. However, the victim's jewelry was stolen and Poirot realizes that to find the murderer, they must first find the jewels. At a village f?te, Poirot runs into an old friend, John Harrison and his fianc? Molly Deane, a fashion model. Harrison invites Poirot and Hastings to tea the following week where Poirot learns that Molly had one been engaged to a local artist, Claude Langton. Poirot is puzzled by a number of apparently unrelated incidents but concludes that someone is being untruthful and that a murder is being planned. Courtesy of Hastings' new hobby, photography, Poirot knows exactly what is going to occur. Insp. Japp is hospitalized with a case of appendicitis. Having been lured to the village of Marsden Leigh under false pretenses - the local hotel owner is unable to solve the crime in his own manuscript and so invites the detective to solve a "murder" - Poirot and Hastings are asked to look into the death of Mr. Mantravers, owner of the local manor house. The local rumor mill has it that the Marsden Manor is haunted by several ghosts and Mantravers' wife is convinced that her husband was frightened to death. 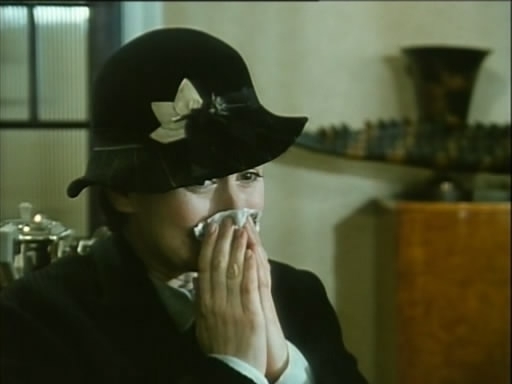 In the end, Poirot initiates a clever ruse to obtain a confession from the murderer. Chief Inspector Japp, afraid that he will soon find himself unemployed, needs Poirot's assistance in solving a string of jewel robberies. Japp is under intense pressure to catch the thief but Poirot counsels patience. When the jewel thief strikes again, Poirot and Captain Hastings go to the home of Marcus Hardman, a jewelry collector from whom an emerald necklace was stolen. Poirot is apparently quite taken with the exiled Russian Countess Vera Rossakoff and to Japp's great consternation, days pass with no progress in the case. With the famous detective otherwise occupied, Hastings and Miss Lemon decide to investigate on their own. Poirot however knows well who the criminal is. 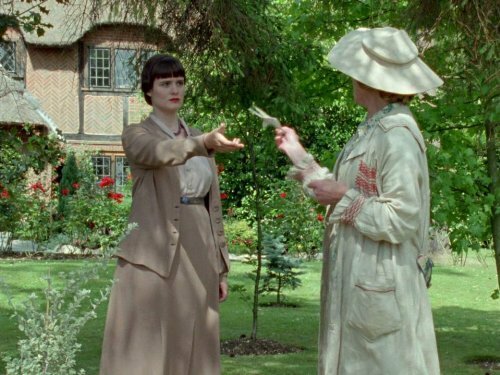 Lady Chatterton asks for Poirot's assistance when she comes to fear for the safety of her friend, Marguerite Clayton. Specifically, she is convinced that Marguerite's husband Edward Clayton, known for his violent temper, will kill her. 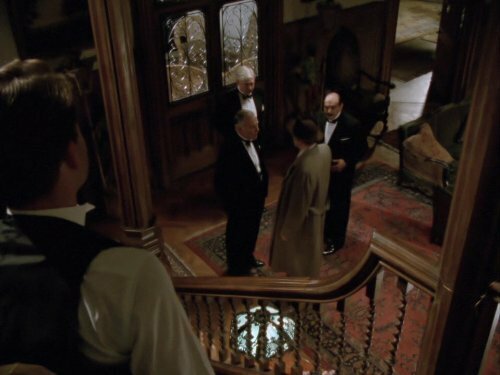 Poirot is invited to a party in order to meet Clayton, but he never shows up. The next day, Poirot finds himself being interviewed by Inspector Japp when Edward Clayton's body is found hidden in an elaborate Spanish chest located in the same room as the party the previous evening. 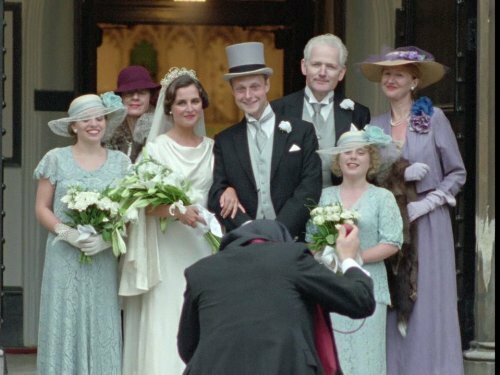 When Marguerite's friend Major Rich is arrested for the murder, Poirot correctly deduces the true nature of the crime and the identity of the culprit. 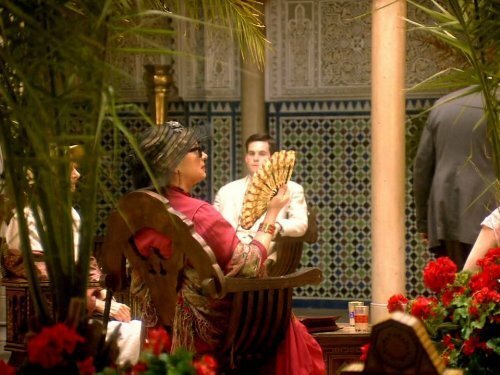 When Prince Farouq of Egypt foolishly lets a tart wear a fabulously valuable royal ruby, she simply walks away with it. With Hastings away in Scotland for the Christmas holidays, Poirot finds himself spending Christmas with the Lacey family. Colonel Lacey, a well-known Egyptologist, was one of the few people who knew the ruby was in England. As Poirot investigates, he learns that the Colonel is having financial difficulties and also that one of the house guests, Desmond Lee-Wortley, may not be of the soundest character. With the help of the children in the household, Poirot sets a trap for the thief. 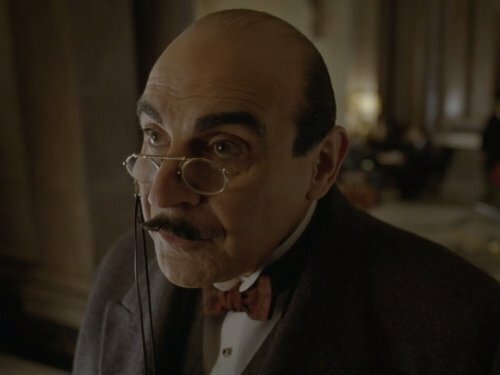 Poirot attends the Victory Ball, a costume party where you are expected to dress as someone famous, as himself. However, when two members of a party of six dressed as characters from classical Italian comedy are subsequently found dead, Poirot finds himself working with Chief Inspector Japp to solve the case. The solution to the deaths of Viscount Cronshaw and Coco Courtney is to be found in determining the correct time of death and identifying an impostor at the ball. Poirot takes to the airwaves and reveals the identity of the killer on a live BBC radio broadcast. 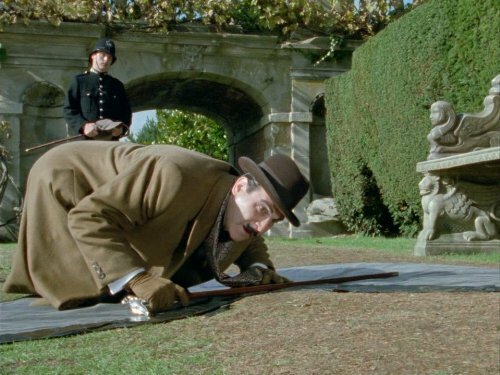 Hercule Poirot accompanies his friend Captain Hastings on a weekend shooting party at the home of Harrington Pace, but he isn't having a very good time. He comes down with the flu and takes to his bed but when Pace is shot dead in his study, he rises to the occasion to assist Inspector Japp in solving the case. Pace was not very likable and treated those around him badly. He refused to acknowledge his illegitimate half brother, who worked on the family estate as the gamekeeper, refusing him even a small loan that would allow him to marry. His two nephews did not benefit from the family wealth having been told they may inherit something on this death. The solution to the case lies in correctly identifying the mysterious housekeeper, Mrs. Middleton, whom Pace had hired for a month and determining her exact role in this mysterious affair. 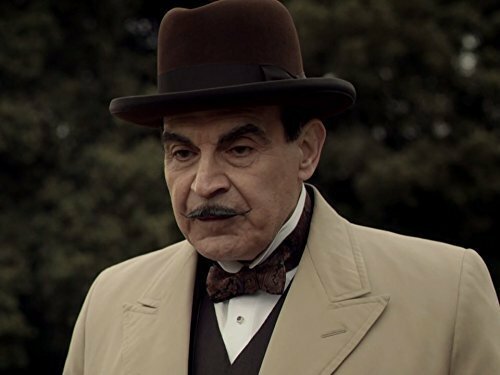 Poirot returns to Britain after a long absence anxious for a new case which will challenge his gray cells. He quickly gets his wish in the form of taunting letters from a serial killer who has dubbed himself ABC and leaves a railroad schedule at the scene of each crime. The victims as well as the crime scenes appear to be chosen randomly, but maintain an obsessive adherence to alphabetical order. However, Poirot grows to believe that the killer is not the madman the authorities believe, but a methodical killer with a very tangible motive. After spending a bit of a holiday in Paris, Poirot finds himself on a flight to London with an odd assortment of people, some of whom he had met during his stay. When one of the passengers, Madame Gisele, is murdered during the flight by a poisoned dart, Poirot is asked by Inspector Japp of Scotland Yard to assist with the investigation. Gisele was a well-known moneylender with penchant towards blackmail. 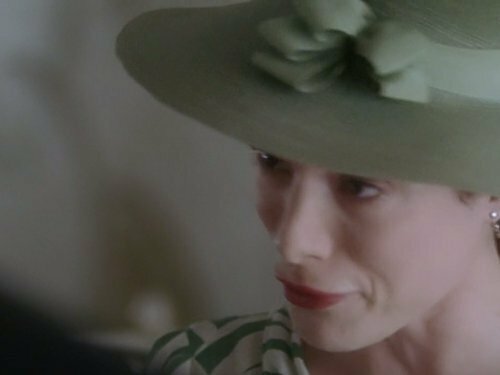 When Lady Horbury denies knowing the dead woman - which Poirot knows is false - the police clearly have their prime suspect. Poirot however, sees a far more complex plot to gain access to the victims money. 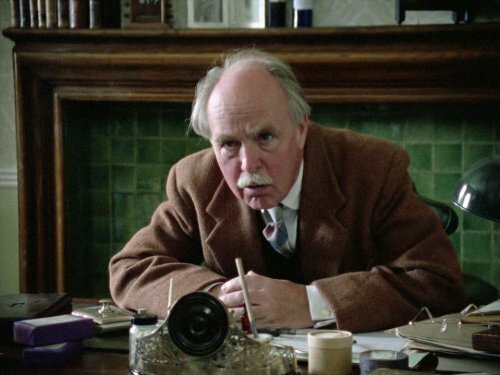 Poirot pays what appears to be a routine visit to Dr. Morley, his dentist, but shortly after he leaves the clinic, the doctor is found dead with a gunshot wound to his temple, an apparent suicide. 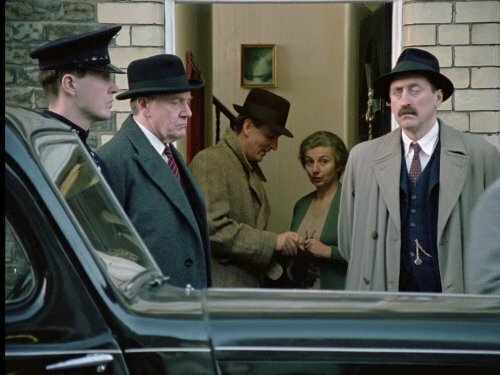 Poirot suspects foul play, and all those who entered the doctor's offices after Poirot left are suspect. They include Alaistair Blunt, a prominent and very influential bank director, Frank Carter, a young fascist thug with a personal grudge against Morley, Mr. Amberiotis, an enigmatic recent arrival from India suffering from a toothache, and Mabelle Sainsbury-Seale, a charity worker also recently returned from India. 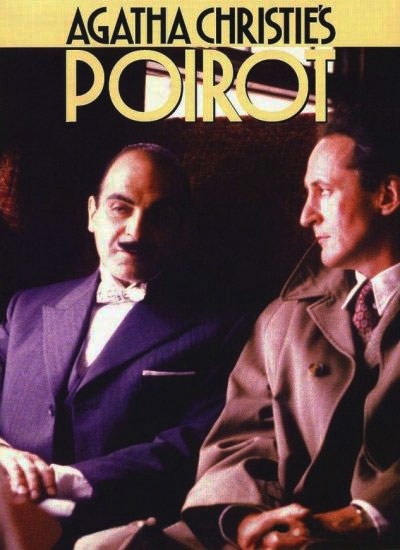 When Amberiotis is found dead in his hotel room from an overdose of Novocaine and Sainsbury-Seale disappears, Poirot rightly expands his list of suspects and connects the crime to events that occurred in India 12 years earlier. Invited to the home of chemical company CEO Rueben Astwell for dinner and to view Mr. Astwell's collection of Belgian miniatures, Poirot finds Astwell universally disliked and shortly thereafter murdered. 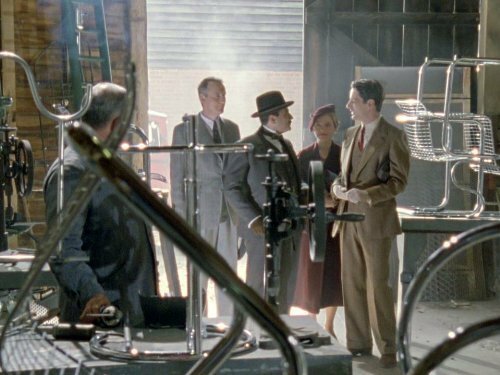 But the murder is only one piece of the puzzle when Poirot discovers Astwell's chemical company has developed synthetic rubber so precious that someone has broken into the company to try and steal the formula. Astwell himself is more than willing to sell it to the highest bidder, even the Nazi's. 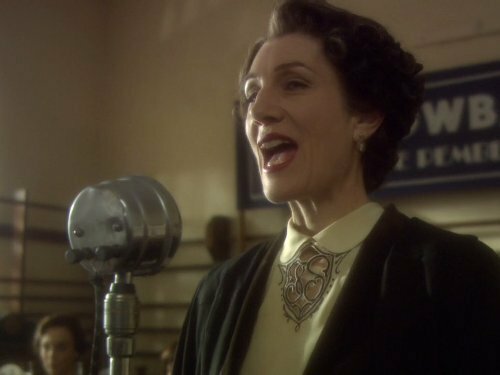 Exactly two years ago, in Buenos Aires, circumstances prevented Poirot from investigating the sudden death of the beautiful Iris Russell. Now he has the chance to try again, this time in London, when a yellow iris, mysteriously left on his doorstep, alerts Poirot that the killer may strike once more. In 1926, rich but childless Andrew Marsh writes a will providing generous bequests to friends, associates, and their children while leaving the bulk of his estate to a medical foundation. He conspicuously omits his young ward Violet Wilson on the chauvinistic grounds that girls will be provided for by their husbands. Marsh's sexist attitudes change over the years as Violet grows into a lovely, independent young woman and publisher of a feminist magazine. He announces that he is going to alter his will and leave 100% of the estate to his ward. 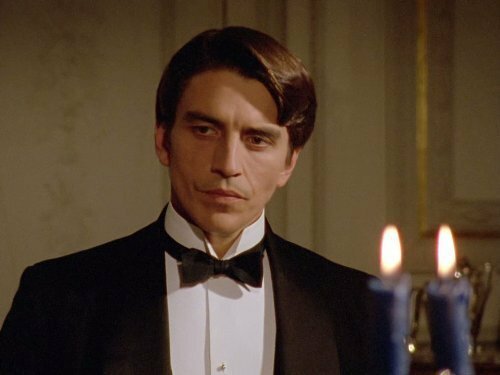 On the same night he confides to Poirot that he is terminally ill and wants the detective to be executor of his estate, he is lured out of the house and murdered before he can write the new document. When his lawyer discovers that the old will has been stolen too, the dead man is declared intestate. 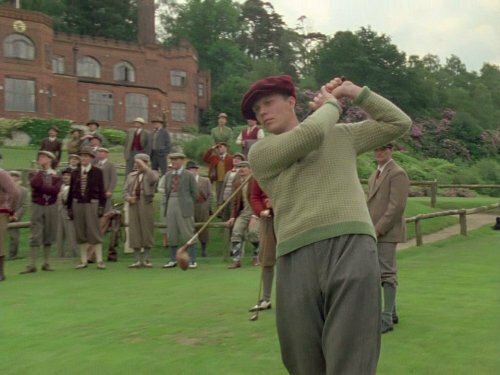 While the local authorities attribute the death to natural causes, Poirot is given reason to believe that Marsh has an illegitimate son, the identity of whom will lead him to the murderer. 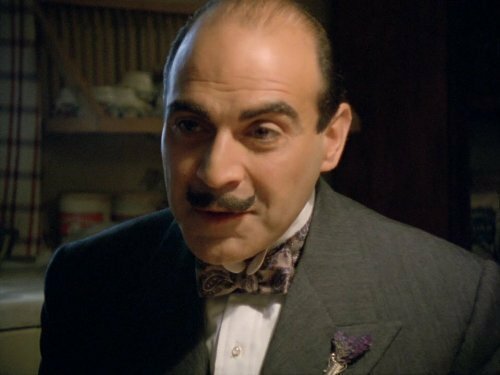 Poirot and his friend Captain Hastings find themselves investigating the murder of Count Foscatini, who was found in his flat. As it turns out, the dead man's valet, Mr. Graves, has been dating Miss Lemon and has been less than honest with her about his profession. As for the dead nobleman, the police believe he was being blackmailed. The Italian Embassy denies any knowledge of the man and denies that he had any official role in the country. Poirot doubts the veracity of their claims but also concludes that others are lying as well. Accompanying Inspector Japp to Brussels, who is receiving an award from the Belgian government, Hercule Poirot tells him a case from 20 years before. Poirot was a young policeman at the time and at the request of Virginie Mesnard, agrees to investigate the death of rising young politician, Paul Deroulard. The courts had already ruled that he had died of a heart attack, but she believes he was murdered. Poirot believed Deroulard had been poisoned, likely from a box of chocolates he had been given by an aristocrat, Xavier St. Alard. In the end, Poirot identified the killer, even obtaining a confession, but chose not to make it public, for reasons that he explains to his colleagues. 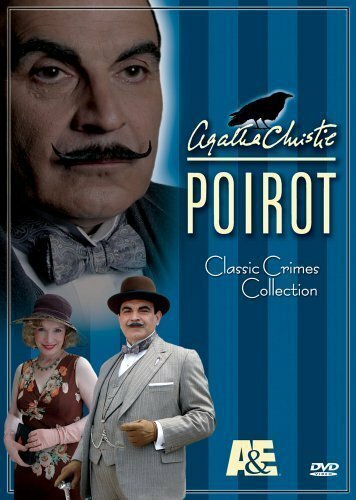 Poirot is outbid at an auction for an antique mirror by the dislikeable Gervais Chevenix, who requests Poirot's attendance at his country home as he believes he is being defrauded by a business associate, John Lake. Poirot arrives at the Chevenix house with Hastings and meets Chevenix's wife Vanda, an eccentric who believes in reincarnation and predicts a death in the household, his adopted daughter Ruth and her cousin Hugo,a struggling manufacturer of tubular steel furniture, who will inherit Chevenix's money if they marry and Miss Lingard, a secretary helping Chevenix research a book he is writing. Hugo is engaged to Susan and Ruth has already married Lake in secret. As the household are dressing for dinner, the butler sounds the gong to summon them, and then a shot rings out. Vanda's prophecy has come true and her husband has been murdered. 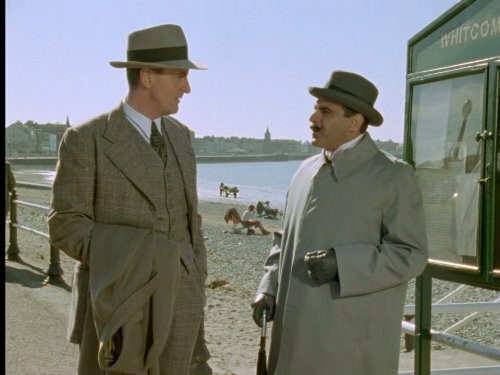 On his doctor's orders Poirot has gone to stay in the seaside resort of Brighton, where he is frequently mistaken for Lucky Len, who gives out money on behalf of a newspaper to people who recognize him. Poirot is staying at the Metropolitan hotel, as are Mr. Opalsen, a theatrical producer, and his wife who is an actress starring in a play at a local theatre. A set of valuable pearls which Mrs. Opalsen wears in the play is stolen from her room, and suspicion falls on her maid Celestine, who was in the room next door. Celestine loves Andrew, the impoverished young author of Mrs. Opalsen's play but they cannot afford to get married and she is accused of taking the jewels to finance their marriage. Poirot solves the case and unmasks the real culprit, being rewarded by Opalsen and getting a bonus when he identifies the real Lucky Len. When Simeon Lee, a mean-spirited, tyrannical patriarch of a dysfunctional family, summons his offspring to his country manor house in Kent for Christmas, he employs Poirot to attend the reunion. The detective is not given a full explanation for his assignment, but he soon observes the palpable animosity, suspicion, and resentment among the three Lee sons. Also in attendance is the beautiful Pilar Estravados, the only surviving child of Lee's daughter, who recently passed away after living in exile in Spain. The ruthless Senior Lee, who made his fortune in the South African diamond fields, sadistically treats his progeny with deliberate cruelty and obviously relishes pitting one against the other. It comes as no surprise when the old man's throat is mysteriously cut in an apparently locked room, and although he was frail and wheelchair-bound, there appears to be evidence of a great struggle. 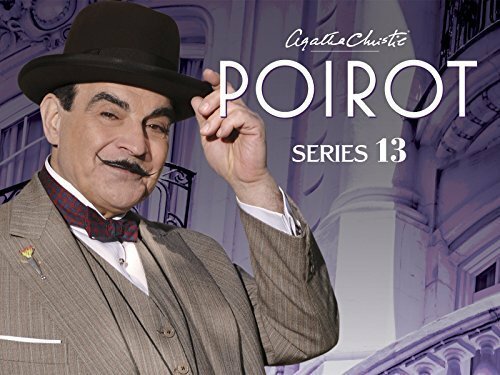 Poirot is aided in his quest for a solution to the baffling mystery by Chief Inspector Japp and local Superinendent Sugden. When a series of apparently minor thefts plagues a university hostelry run by Miss Lemon's sister, Poirot is recruited to investigate. Celia Austin, a pharmacological major, confesses that she is a kleptomaniac and responsible for most of the thefts but denies stealing several objects including a stethoscope, light bulbs, and a student rucksack. Furthermore, she claims to know the other thief and vows to help return the missing items. Unfortunately someone substitutes an overdose of morphine for one of her sleeping powders, and she takes the identity of the thief to the grave. Japp connects the murderer's m.o. with a cold case he had investigated ten years earlier, but the prime suspect in that crime, a powerful statesman, now lies dying in a local hospital. 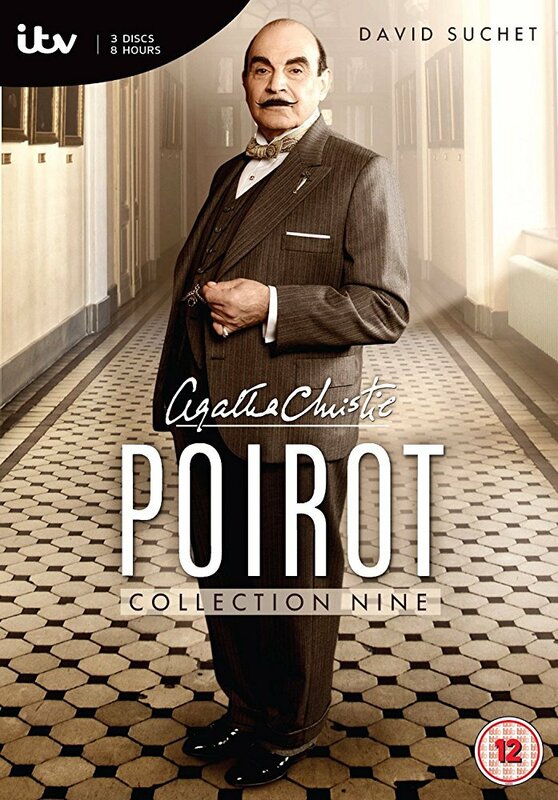 Despite numerous obstacles, Poirot is able to link the killing to an international diamond smuggling ring but not before the murderer claims more victims. Poirot and Hastings are in Deauville, and Poirot is approached by business-man Paul Renaud concerning threats by Chileans. The next morning the maid finds Madame Renaud bound and gagged and her husband's corpse is later found on a nearby golf course. Giraud, a pompous French police officer, dismissive of Poirot's reputation, lays a wager with him. The detective who fails to catch the killer must make a sacrifice. Giraud will relinquish his trade mark pipe. Poirot must shave off his moustache. Hastings is invited by his friend Charles Arundell to be at hand when he tries to break a water speed record on a Berkshire country lake, but his boat's engine fails him. 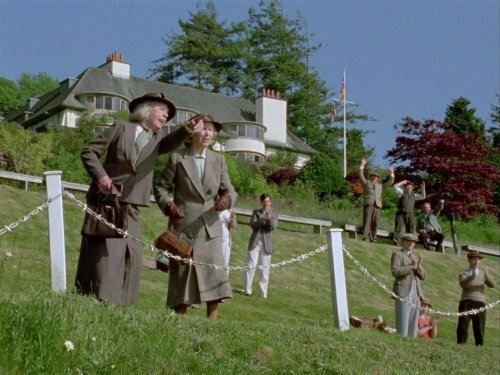 At a subsequent reception at the estate of Charles' well-to-do aunt, Poirot and the other guests witness her refusal to continue to underwrite Charles' expensive hobby, and he threatens her. Later, when she is almost killed in a freak accident involving her pet fox terrier Bob, she confides to Poirot that she suspects a family member of trying to kill her to gain part of her estate. The detective advises her to disinherit her grasping relatives and name a friend as beneficiary. Despite this precaution, she dies abruptly under questionable circumstances, but the local authorities refuse to authorize an autopsy. Suspecting foul play, Poirot looks to his wits as well as the Arundell dog, who remains a silent witness to murder. Living quietly in the small village of King's Abbot, sleuth Hercule Poirot becomes involved in the murder of successful industrialist Roger Ackroyd. The number of potential killers is almost as great as the population of the village itself. As Poirot investigates he sees that there might be a connection to the suicide of a local woman, and the death the previous year of her husband. Lady Edgeware, the well-known stage actress Jane Wilkinson has a dilemma in that her husband has consistently refused to give her a divorce. She asks Hercule Poirot to visit the man and see if there is any possibility of convincing him. Lord Edgeware is nothing short of nasty treating all of those around him very badly. When he is found dead, there is no great surprise but there certainly a good number of suspects. The police believe Lady Edgeware to be the culprit but she has a cast iron alibi having attended a private dinner over the time her husband was killed. There is also the man's nephew, who would inherit his fortune; his personal assistant, whom he treated very badly; and then there is the family butler who clearly has his own interests at heart. Recovering from a sudden collapse, Poirot finds little comfort in doctor's orders confining him to a strict regimen at an island health resort with Captain Hastings. However, better medicine is to be found in the murder of another guest, a famous film actress, and a long list of suspects. 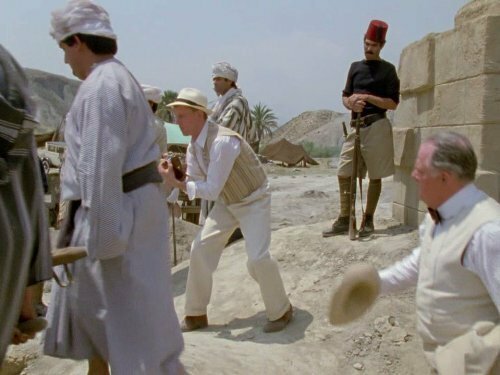 While accompanying his friend Hastings to a dig in Iraq, Hercule Poirot becomes involved in the murder of an archaeologist's wife. The victim, Mrs. Leidner, had been receiving threatening letters signed by her first husband, who was known to have been killed in a train wreck. Did he survive? Was it his younger brother who was avenging his memory? Did Miss Johnson get rid of her rival for her employer's affections? Did Richard Carey kill the woman he publically announces that he hates? Is the French priest really who he pretends to be? And how many deaths will occur before Poirot unmasks the murderer? Fourteen years after her mother, Caroline Crale, was hung for the murder of her artist father Amyas Crale, Lucy Crale asks Hercule Poirot to investigate her father's death. She is convinced that her mother was innocent but is prepared to accept the truth, whatever that may be. Poirot visits in turn all five persons present when the murder took place including Amyas' best friend, Philip Blake, who was visiting the Crales when Amyas was killed; Philip's brother Meredith from whom Caroline supposedly stole the poison used to kill her husband; Elsa Greer, who was sitting for a portrait and with whom Amyas was supposedly in love; Caroline's half sister Angela who despised Amyas but believed her sister to be innocent; and Miss Williams, the governess. Having heard the tale from five different perspectives, Poirot reunites them all to identify the murderer. Distant cousins and childhood friends Elinor Carlisle and Roddy Welman are happily engaged to be married. One day Elinor receives an anonymous letter in the post, claiming that someone is trying their hardest to work their way into the affection, and subsequently also bank account, of her wealthy aunt Laura Welman, who is presently bedridden at her home since after a stroke and from whose death Elinor and Roddy both expect to inherit a large fortune. Not knowing what to make of the letter, the young couple eventually decide to pay Laura a visit in order to see for themselves what is really going on at the house. When they arrive, Elinor immediately becomes suspicious towards Mary Gerrard, the lodge keeper's daughter, recently returned to England after having studied in Europe and whom everyone else at the house seem to absolutely dote on. No one else however seem to share Elinor's suspicions or dislike of the young woman, and in particular not Roddy, whom Elinor one night discovers kissing Mary Gerrard in her aunt's drawing room. When Mary suddenly turns up dead, poisoned by a salmon sandwich, Elinor's dislike of Mary makes her the obvious suspect and hardly has time to take in what has happened before she finds herself on trial and condemned for murder. 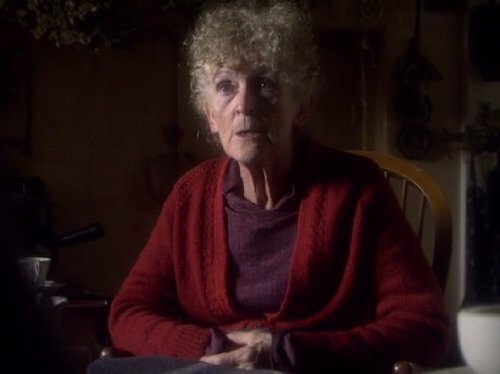 The only person who is not entirely convinced of Elinor's guilt is Doctor Peter Lord, who decides to contact his old friend Hercule Poirot in order to help him prove her innocence. While on their honeymoon in Egypt, newlyweds Simon Doyle and Linett Ridgeway are constantly harassed by Simon's ex-fianc?e Jackie De Bellefort who feels her ex-best friend has stolen the love of her life. A holidaying Hercules Poirot counsels Jackie to put an end to her antics, fearing that all of this can only end in tragedy. 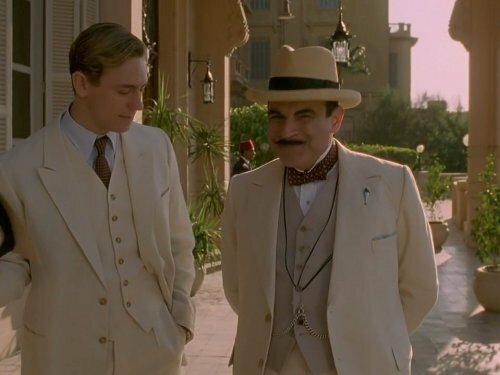 When one of the passengers is killed while on a cruise down the Nile, Poirot must sift through an odd assortment of passengers, all of whom may have something to hide. There is Linett's financial advisor from the US, her French maid who clearly has something to hide, the Austrian doctor who keeps mostly to himself and the left leaning philosopher who despises the rich. 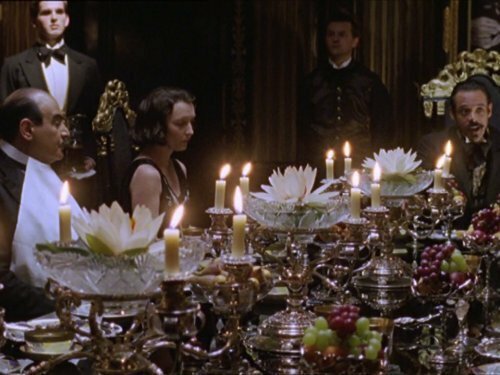 While spending the weekend at his cottage outside London, Hercule Poirot is invited to dinner by Sir Henry and Lady Angkatell. Leaving immediately after dinner, he returns the next day to find that a weekend guest, John Christo, has been shot dead. There is any number of suspects: his former lover, Veronica Cray whom he had not seen for 12 years but suddenly turned up at a nearby cottage; his wife, Gerda who was deeply hurt by his womanizing; his current mistress Henrietta Savernake; Midge Hardcastle, who was very much in love with him, but whom he constantly ignored; and Edward Angkatell, who was in love with Midge. What Poirot finds however is that the evidence equally implicates everyone just a little too equally for it all to be just by chance. After traveling on the Blue Train from Calais to Nice, Hercule Poirot is pressed into service to help solve the murder of heiress Ruth Kettering who is found savagely beaten in her compartment. She was the daughter of wealthy industrialist Rufus Van Alden and very much wanted a divorce. Both her husband and her lover were on the train but she had changed rooms with another passenger, Katherine Grey, so the question naturally arises as to whether she was the intended victim. Grey may also have had enemies as she had recently inherited a very large sum of money and greedy relatives had suddenly taken a interest in her. 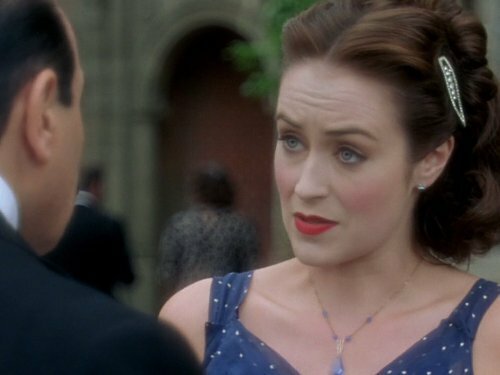 When an attempt is subsequently made on Grey's life, this appears to the case but Poirot methodically sifts through all of the clues to determine the motive and identify the killer. Hercule Poirot finds himself investigating the murder of his dinner host, Mr. Shaitana who was stabbed in the heart while his guests played bridge. There are 8 guests and Poirot finds himself in the company of three other investigators. 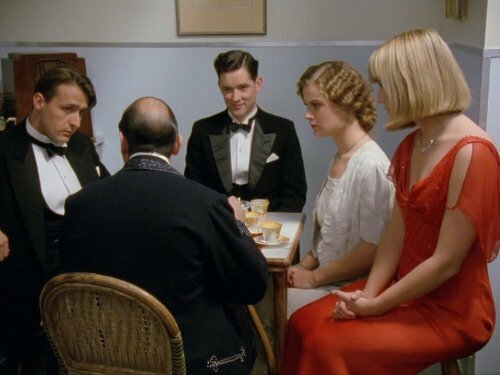 The foursome interview each of the other guests in turn but make little headway until Poirot manages to reconstruct the various bridge hands played at the suspects' table. In doing so, he is able to identify one particular action that leads him to identify the killer. His friend, solicitor Gilbert Entwhistle, asks Hercule Poirot to help solve a riddle and a murder. The riddle has to do with Richard Abernethie's will. It would seem that he changed his will immediately prior to his death, distributing all of his wealth equally among family members but excluding George Abernethie who, in all previous wills, had been the sole beneficiary. The two had supposedly argued recently, but Entwhistle suspects the new will may be a forgery. 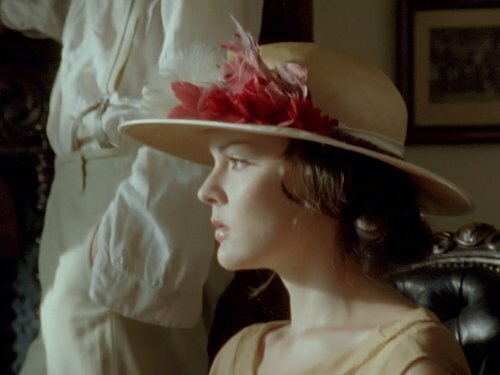 As for the murder, he would like Poirot to investigate the death of Cora Galaccio, who was violently beaten to death the day after Richard's funeral. She too had inherited from the suspect will, but are the two deaths and the will all part of a greater plot, or is there a simpler explanation? Hercule Poirot finds himself trying to solve the mystery of the Cloade family. Rosaleen is the young widow of Gordon Cloade who was killed in a gas explosion in his London home. Rosaleen has inherited her late husband's substantial fortune and she and her brother David Hunter are refusing to share it with other members of Gordon Cloade's family. There have been persistent rumors that Rosaleen's first husband, an intrepid explorer, is still alive and as such would nullify her marriage to Gordon. What Poirot learns however is of a far greater deception that will alter everyone's perception of what they believe to their reality. James Bentley is tried for the murder of Abigail McGinty, the charwoman of Broadhinny who also took in Bentley as her lodger. The evidence is overwhelming, and soon after he is sentenced to hang. 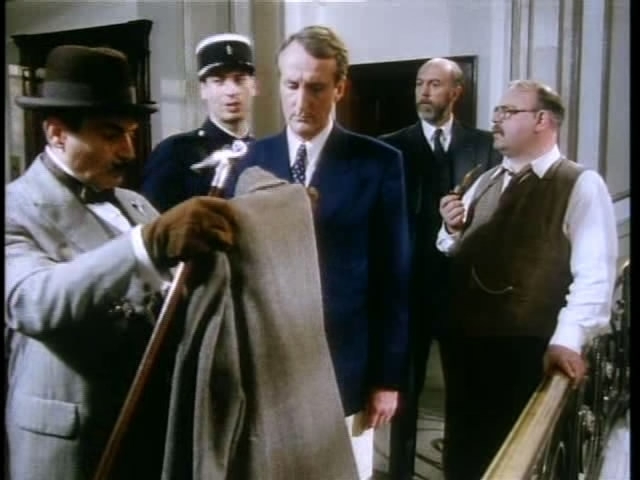 Superintendent Spence is not convinced of the man's guilt, and so he visits Poirot, asking him to look into the case. Poirot then heads off to the village, where he becomes the paying guest of Maureen and Major Johnnie Summerhayes. Ariadne Oliver, Poirot's novelist friend, has also come to Broadhinny to collaborate on a stage adaptation of one of her novels with dramatist Robin Upward. With the clue of a bottle of ink purchased by the dead woman shortly before her death, Poirot searches Mrs. McGinty's belongings and finds an edition of The Sunday Comet newspaper, where an article concerning two women connected with famous murders has been cut out. With the story are two photographs of the women. 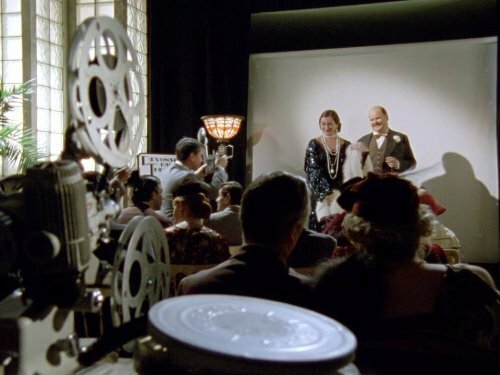 Poirot discovers that Mrs. McGinty had seen one of the photographs before, and knew to whom it belonged to. But which woman was this case connected with? Are any of the people living in Broadhinny related to these women, as one of their children? Or perhaps one of them is one of the actual women? The puzzle pieces begin to fit in, especially after Poirot is shoved into the path of an oncoming train by an unknown entity. But will the murderer strike again? When the middle-Eastern country of Ramat is over-run by anti-monarchist revolutionaries, the surviving heir to the throne, Princess Shaista, is spirited away to safety in a small girls' school, Meadowbank, which is run by the progressive Miss Bulstrode. However, when the bullying games mistress Miss Springer is found stabbed through the chest with a javelin, it appears that Meadowbank may not be the haven it promised to be. As Poirot assists Inspector Kelsey, they begin to find that some of the staff may not be quite what they appear, a situation which is compounded when another teacher, Mademoiselle Blanche is found dead and Princess Shaista is kidnapped from the school. With the princess' life in peril, and the prized rubies of Ramat missing, it is up to Poirot to discover who is the cat among the pigeons. 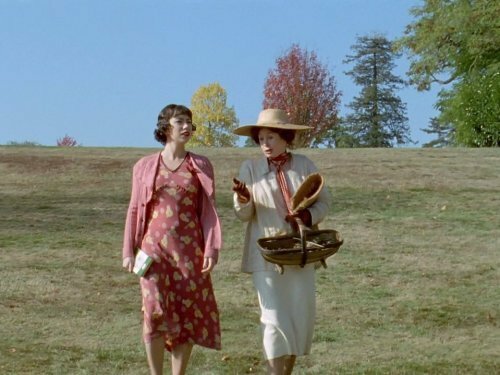 Poirot is visited by a distraught girl, Norma Restarick, who fears she may have killed someone but runs away, telling him,"You're so old", rather than explaining further. 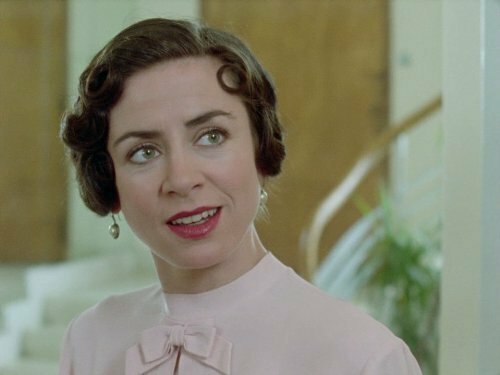 By coincidence, Poirot's friend Ariadne Oliver lives in the same apartment block as Norma and her two room-mates and recently went to their party, where Norma was distressed when she was offered ice-cream. Norma's ex-nanny, Miss Seagram, an alcoholic, also lived in the block but was recently found dead, with the verdict being suicide. Ariadne is unconvinced and searches the nanny's apartment, finding a clue which she puts in her hand-bag. Soon afterwards she is attacked and the bag and its contents stolen. Poirot visits the Restarick family home in the country, owned by Norma's great-uncle, Sir Roderick, an elderly, half-blind man, dependant upon Sonia, his young personal assistant, who may well be a gold-digger. 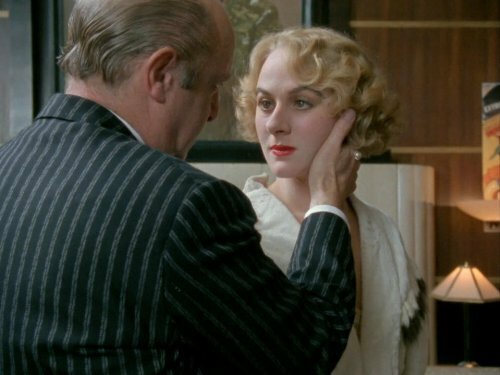 Andrew Restarick, Norma's father,explains to Poirot that he spent much of Norma's childhood working abroad, leaving her with her unstable mother and Nanny Seagram. 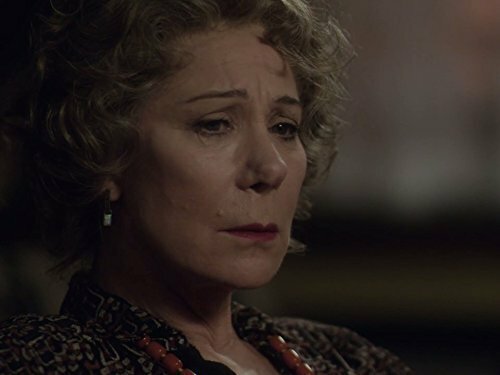 Norma admits to Poirot that she blames herself for her mother's suicide, which took place when the little girl was on an outing with the nanny and wanted to stop for an ice-cream. She now believes that if she had got home earlier she would have saved her mother, hence her revulsion at being offered ice-cream. Poirot and Ariadne visit Miss Battersby, Norma's former school-teacher, where they discover something very suspicious about Norma's friends and family. 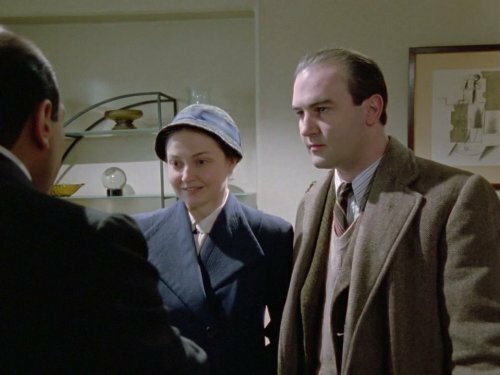 Also convinced that Miss Seagram's death was not suicide, Poirot enlists Norma's help in setting a trap to catch whoever killed her old nanny and is now trying to frame her. Syria, 1937:- Hercule Poirot is one of several people present at an archaeological dig to find the skull of John the Baptist, led by the exuberant Lord Boynton and his loyal son Leonard, the enterprise having been financed by Boynton's rich, rude and over-bearing American wife. She bullies her three adopted children, Carol, Ginny and Raymond and the family's ex-nanny. Sarah King, an English doctor, falls for Raymond and would love to tear him from his mother's apron-strings and another doctor, Dr. Gerard, takes an interest in Ginny, as does a Polish nun, who, with Ginny, is subject to an attack - by white slavers, according to the independent travel-writer Celia Westholme. A mysterious young American, Jefferson Cope, whose link to the Boyntons seems tenuous, completes the group. Only his Lordship has any love for his wife so that , when she is found stabbed to death, one blisteringly hot afternoon, Poirot has more than his fair share of suspects to interrogate. Investigating a spy-ring Colin Race comes to Wilbraham Crescent, where he literally bumps into agency typist Sheila Webb, as she comes flying out of number 19, the home of blind ex-teacher Millicent Pebmarsh. Sheila has discovered the body of a man whose identity proves hard to confirm, surrounded by four clocks, stopped at the same time. Miss Pebmarsh does not know the man and did not ask for the services of Sheila, who is the initial chief suspect. 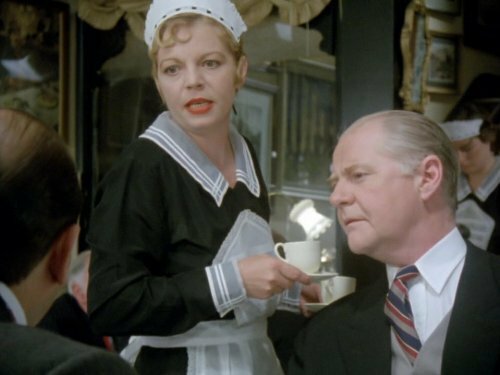 However, as Poirot is brought in to assist Inspector Hardcastle in the case, and the murderer strikes again, Poirot comes to realise that the man was killed elsewhere and brought to Miss Pebmarsh's house. 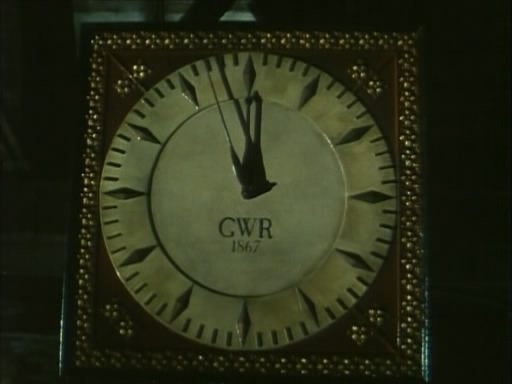 The neighbours claim to have seen nothing but Poirot believes one of them may have had a secret which was worth killing for and sets out to unmask them, as well as explaining the significance, if any, of the clocks. At the same time Colin solves his investigation but with mixed results. The inoffensive Reverend Babbington chokes to death at a cocktail party he is attending with his wife at the home of famous actor Sir Charles Cartwright. Some time later Sir Bartholomew Strange, an eminent doctor and friend of Cartwright, also dies of poisoning at a dinner party he is giving miles away. 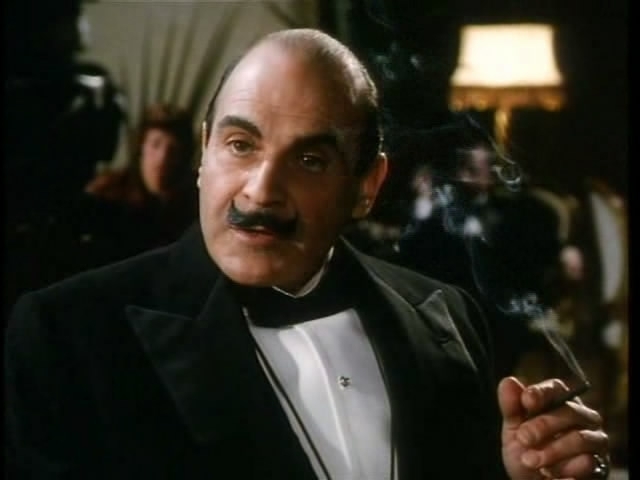 There appears to be no link between the two deaths but Poirot, assisted by Cartwright, offers to help Superintendent Crossfield in the investigation and discovers that a mysterious butler with a birthmark on his wrist was hired for the night and appeared to share a joke with the dead doctor. This man has now vanished and would seem to the killer. A third death, that of a sanatorium patient who has written to Poirot, would appear to link to the doctor's murder and there is certainly a secret which somebody will go to any lengths to conceal - but who would gain from the death of a harmless old vicar? When Ariadne Oliver and her friend, Judith Butler, attend a children's Halloween party in the village of Woodleigh Common, a young girl named Joyce Reynolds boasts of having witnessed a murder from years before. Joyce's story is heard by all the party, including her strange brother Leopold, the impeccable hostess Rowena Drake, her bookish son Edmund, and the local Reverend Cottrell. Mrs Whittaker, the church organist, and Frances Drake, Rowena's feisty daughter, are dismissive of her story, but later that evening Joyce's lifeless body is discovered face-down in the apple-bobbing bucket. At Mrs Oliver's behest, Poirot travels down to Woodleigh Common to investigate the murder. Although the local police and Joyce's stepmother dismiss the dead girl's claim, Poirot takes Joyce's story seriously. 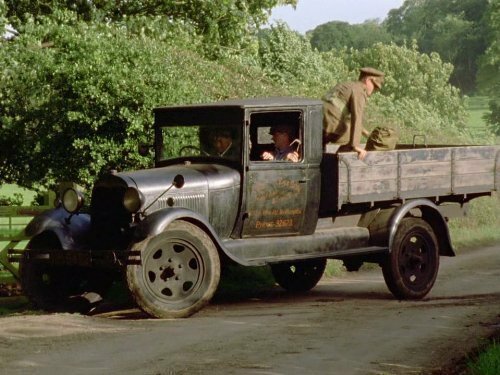 Mrs Goodbody, a gossiping charwoman, tells Poirot there have been a number of suspicious deaths in the village in recent years which Joyce could indeed have witnessed, and that old curses still haunt the village - a claim supported by the affable gardener, Michael Garfield. While Poirot is busy piecing together the facts, another child is found drowned in a river. He realizes that he needs to act quickly in order to save Judith's daughter, Miranda, who is also in danger. Returning to London from Istanbul, Hercule Poirot finds that the Orient Express is fully booked, despite the low travel season. Thanks to Mess. Bouc, a Director of the line, he is found accommodation among the many and varied passengers. Soon after coming on board, he's approached by a rude American. Mr. Ratchett, to work for him but Poirot dismisses him out of hand. When Ratchett is found dead the next morning from multiple stab wounds, Bouc insists that Poirot solve the crime before the police arrive. He soon identifies the dead man as the infamous kidnapper Cassetti who was responsible for the death of little Daisy Armstrong but managed to evade conviction. 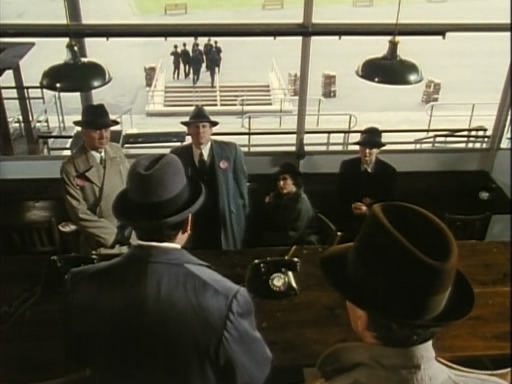 As Poirot pieces together the clues in the case, it becomes apparent that several passengers on the train have a connection to the Armstrong case and a reason to want him dead. A Russian grand master dies mysteriously during an international chess match. The case is related to a political intrigue involving the so-called Peace Party and its leaders Madame Olivier and Abe Ryland. Poirot investigates with his old friends Hastings, Japp and lemon, helped by a reporter and a minor actress, but the quartet must soon fight a dangerous battle with the Big Four, a secret society manipulating for their own personal chess game a great number of international celebrities. Ariadne Oliver is asked to devise a murder hunt for a Devon fête, but her sense of foreboding summons Poirot to the scene. 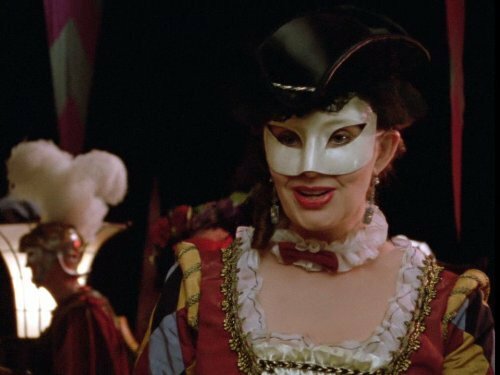 Her fears are realized when, during the fête, the girl playing her murder victim winds up well and truly murdered. In an attempt to snare the enigmatic art thief Marrascaud, Poirot and the Metropolitan Police set an irresistible trap: at the society debut of wealthy aristocrat Lucinda Le Mesurier, a priceless painting called 'Hercules Vanquishing the Hydra' by Marrascaud's favorite artist will be displayed, with Lucinda wearing exquisite diamond jewelery. A confident Poirot is convinced the criminal will be apprehended, but he does not foresee the eventual, disastrous outcome: not only does Marrascaud pinch the painting, but Lucinda herself is brutally murdered, and her jewels are stolen as well. The catastrophe weights heavily on Poirot's conscience, and he sinks into a steady depression, despite the entreaties of his physician, Dr Burton. Three months after Lucinda's murder, a lonely chauffeur asks Poirot to find his true love, the maid of celebrated Russian ballerina Katrina Samoushenka. 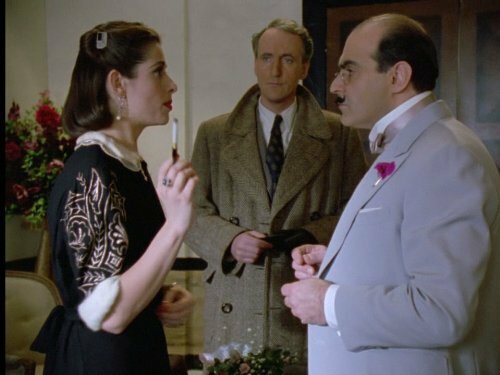 Pitying the man, Poirot agrees to reunite the lovers pro bono and sets off to the Hotel Olympos in Rochers Neiges, Switzerland, where Katrina is supposedly staying. Run by the hearty (yet corrupt) Italian Francesco, the hotel is world-famous for its Alpine spa treatments, and much to Poirot's surprise, it is also Marrascaud's current hideout. But what identity has the villain taken? 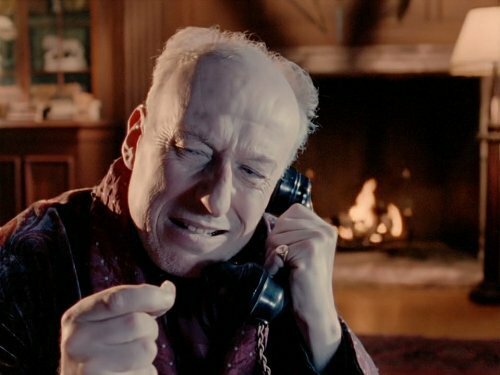 Among the guests, Poirot not only finds the bedridden Katrina, but also her imperious Austrian psychotherapist Dr Lutz, M.P. Harold Waring, who has shouldered the blame for an illicit scandal involving his superior, bossy Mrs Rice and her daughter Elsie Clayton, whose abusive husband is also staying at the hotel, parlor-game enthusiast Schwartz, and the only woman who has ever stirred his heart: former jewel thief Countess Vera Rossakoff, whose criminologist daughter Alice Cunningham is also present, along with her unsightly pet bulldog, Binky. A motley crew, indeed, and just as impenetrable. When an avalanche strands the guests, it becomes even more imperative to find Marrascaud. But several distractions prevent Poirot from facing his nemesis. Why is Katrina being deliberately evasive about the fate of her maid? Why does Dr Lutz have such a powerful hold on her? Why does Elsie's husband always dine in his room? What is Countess Rossakoff doing in Switzerland, and has she really given up her life of thievery? Why is Schwartz so hard to read? What happened to the old servant, Robert, and why is his replacement so inexperienced? Who tried to frighten Alice? As more and more questions pile up, less and less time remains as Poirot strives towards redemption for his past mistakes. But will he succeed in battling his inner demons as Hercules succeeded in conquering his twelve Labours, or will Marrascaud be the first criminal to prevail against the Belgian detective? 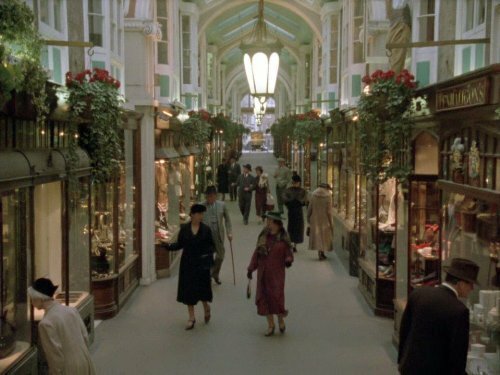 Still mourning the untimely death of his wife, Bella, Hastings is summoned to Styles Court in Styles St. Mary by his old friend Poirot. 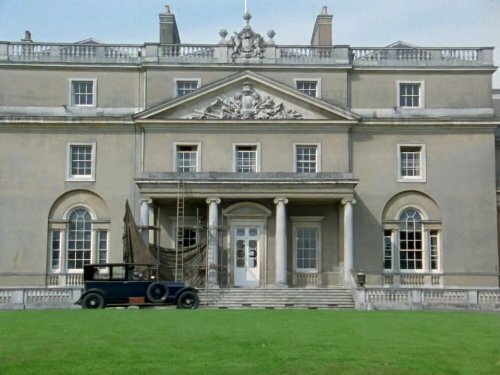 It is the country manor where, thirty years previously, he and Poirot had first met in England and where they had also solved their first murder mystery together. 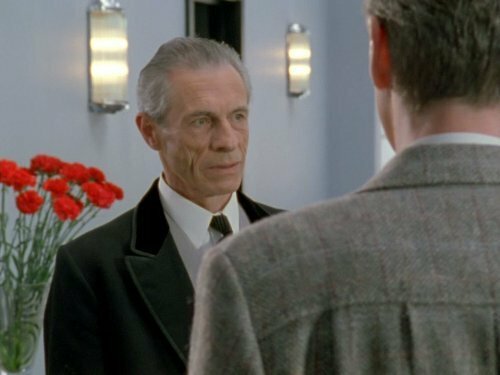 Now, Styles has changed hands and is being run as a modest post-war guest house, and it is here that Hastings makes a gut-wrenching discovery: Poirot's health has taken a turn for the worse. 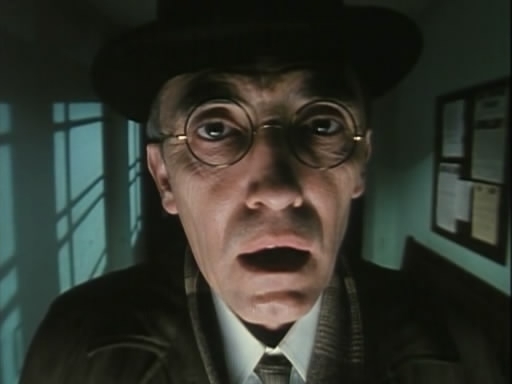 The Belgian detective is now old, gaunt, arthritic, and confined to a wheelchair as he battles a weak heart. 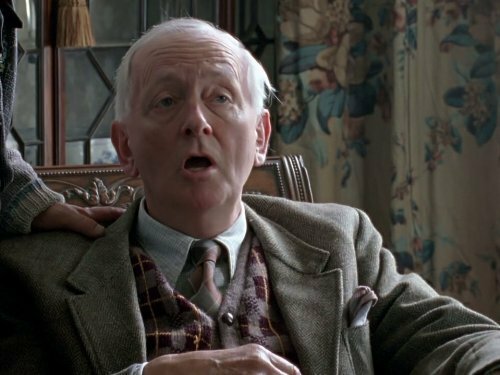 But his little gray cells are as active as ever, which is why Poirot has called him to Styles in the first place - a murderer is in their midst, and may be ready to strike again. 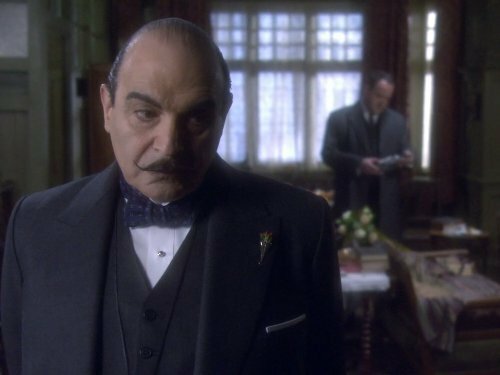 He asks Hastings to be his eyes and ears about the place, for Poirot does not know who is likely to be the killer's next victim. Being as observant and vigilant as possible, Hastings takes stock of his fellow company, which includes Styles' elderly owners Daisy and Colonel Toby Luttrell, melancholy spinster Elizabeth Cole, charming aristocrat Sir William Boyd Carrington, perceptive birdwatcher Stephen Norton, dashing womanizer Major Allerton, introverted chemist Dr John Franklin and his unpleasant wife Barbara, Mrs Franklin's caretaker Nurse Craven, and, most significantly, his fiercely independent daughter Judith, currently working as Dr Franklin's laboratory assistant. Any one of these people could be a killer, but Hastings is at a loss as to exactly who, especially since he seems more interested in reconnecting with his estranged daughter and protecting her from indecent cads like Allerton. But soon, the murderer's presence becomes apparent: first, Colonel Luttrell nearly kills his wife in a supposed shooting accident, and then Barbara Franklin dies after ingesting a toxic alkaloid that her husband has been researching. Just when a solution seems in sight, Norton is found dead from a gunshot wound. Who is behind these cold-blooded acts, and for what reason? How much has Poirot been withholding from Hastings, and were any of these events truly preventable? What has Judith been hiding from her father, and can the two be reconciled despite their differences? What role does Shakespeare play in the proceedings? And, finally, can Poirot solve his final case in spite of his deteriorating health, or will the curtain come down on him before he can bring a ruthless killer to justice?